Founded in 2013, Cayambis Music Press embodies the realization of a long-held idea to promote and publish the finest chamber music from Latin America. This idea represents the convergence of a number of independent threads, including direct experiences in Latin American musical institutions and organizations, academic research interests and prior participation as part of a music publishing editorial team. Consequently, we are proud to say that today, Cayambis Music Press represents the music of 58 composers from 15 different countries. 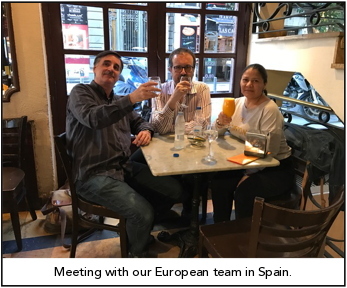 In addition to our main workshop and distribution center in Virginia, our company also operates a fulfillment center in Spain to serve the needs of musicians in Europe. And finally, Cayambis Music Press is the authorized distributor for the Fundación Juan Bautista Plaza, a Venezuelan institute that publishes the works of Juan Bautista Plaza, who was one of that country’s most important composers of the 20th century. Our mission is to provide the North American and European markets with the finest quality music from Latin America published to the highest standards. In addition, a core value of our company is to encourage and promote the performance of this music and to provide essential resources in support of our overall corporate mission. The scores that we receive are first be evaluated by an editorial committee. To date, fewer than a third of these submissions have been approved for publication. Approved scores are meticulously prepared and then reviewed by both the editorial team and the composer prior to publication. Our company is actively engaged in the performance of our publications through our in-house ensemble, the Cayambis Sinfonietta. 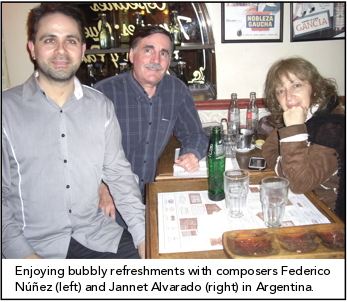 Our company maintains a blog that is devoted to discussion and commentary about the creation, performance and evaluation of Latin American classical music. With our “Artist Program,” we develop relationships with recognized artists and ensembles in order to promote the performance of Latin American music. Through our “Latin American Voices” podcasts, we encourage a dialog between our composers and the North American public. We maintain a profile page for each Latin American country that includes vital resources and links to important individuals and institutions. Although some of our music could be said to have a “Latin” sound (Ecuadorean Marcelo Beltrán’s use of folk music falls into this category), our catalog consists of a diverse range of musical styles and genres. For example, Chilean Nicolás Kliwadenko and Venezuelan Luis Pérez Valero use a contemporary musical language that focuses on instrumental timbre, Peruvian Antonio Gervasoni prefers a more descriptive, almost programmatic approach to composition and the music of Guatemalan Gabriel Yela, while essentially tonal, is influenced by procedures generally associated with expressionism. On the other hand, Mexican composer Demian Galindo’s music for brass instruments is just fun to play. In any event, our website has been designed to make your selection as easy as possible. We realize that the names and titles may not be familiar to American audiences, and for that reason all of our composers have provided brief biographies. Clicking on the title of any composition will take you to that composition webpage, where you will find a short musical example as well as brief and extended descriptions. On a number of our product pages you’ll find an audio file or even a YouTube video. Or, if you are looking for a specific instrument or would like to explore the music of a specific country, use our search field to take you directly to those results. 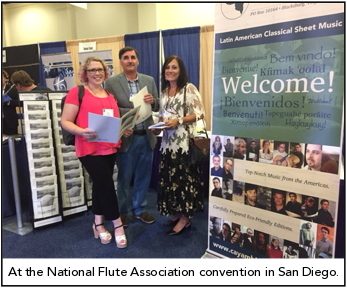 Finally, Cayambis Music Press is proud to be affiliated with the American Society of Composers, Authors and Publishers (ASCAP), Broadcast Music International (BMI) and the National Flute Association (NFA). Welcome to Cayambis Music Press! We hope that your experience with our website and our music is entirely to your satisfaction. But if you have any comment or suggestion, we would love to hear from you.